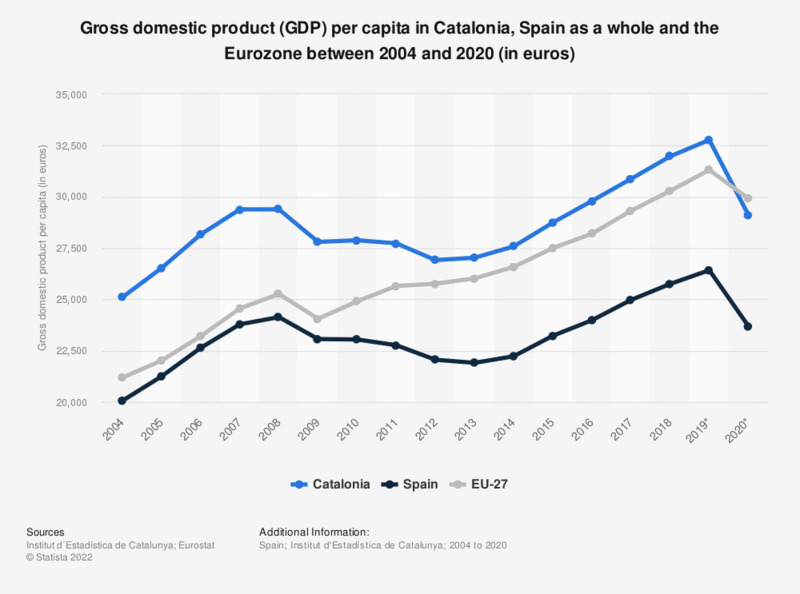 This statistic compares the gross domestic product (GDP) per capita of Catalonia, Spain and the Eurozone average between 2004 and 2017. GDP refers to the total market value of all goods and services that are produced within a country per year. It is an important indicator of the economic strength of a country. Despite following a similar trend to the rest of Spain, the region of Catalonia had a higher GDP than average for the country and was closer to the Eurozone average. In 2017, the Eurozone had the second highest GDP per capita of all regions worldwide, amounting to roughly 37 thousand U.S. dollars, compared with 23 thousand U.S. dollars of all Europe and central Asia. Overall Spain had the fifth largest GDP in the European Union in 2017, after Germany, followed the the United Kingdom, France and Italy respectfully, amounting to 1.23 trillion U.S. dollars. This makes Spain the 14th largest economy in the world when measured by GDP. * Provisional data for Spain.